Would you be able to attach a copy of your file that is exhibiting this problem please? It sounds as though you might have some paragraph markers or other characters making the cell bigger. I started a new document, and recreated the table using the newer release of the Publisher (1.7.0.133), and this table behaved well. Attached is the original file, and I cannot tame row 7 of this table. This was copied and pasted from a pdf file, and that may be the source of the problem. Thanks for that Ray! I've reproduced it with your file, but if you could attach the PDF you used to paste from that and also what PDF Reader you were using to open the PDF! I've had this one - and trying to reduce the height in the tables menu also increases the size even using the reduce arrows so clicking once on the reduce arrow increases the size by a huge amount - but only on the last row? I cannot provide the exact pdf file, this file is fluid, I change it regularly and don't keep all old versions. Attached is one file that is a version very close to the one I was copying. The pdf was constructed in PagePlus X9 and published as a pdf. 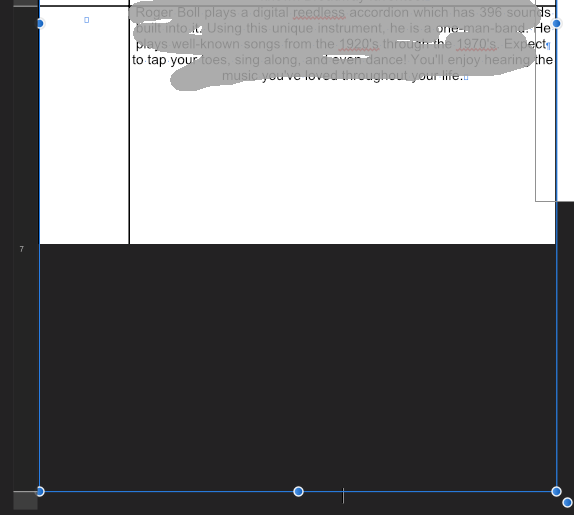 To test Affinity Publisher, I opened the pdf in Publisher to see what I would get; unfortunately Publisher did not bring in a table, just text boxes and individual line segments. So I started a new table in this same file, and with the imported pdf and the new table all in the same document in Publisher, I started copying the texts from the imported page to the new table.